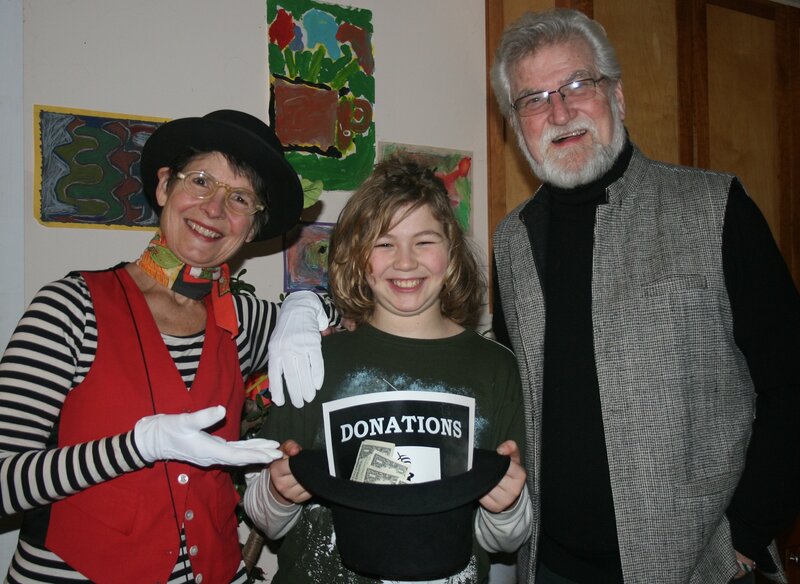 There was a wonderful night of Fun(d) Raising for a packed house at the Lincoln, VT Community Library on January 29th. The event was organized by Jade Edward, a sixth grader at The Lincoln Community School, as part of the Positive Change Project. His teacher, Molly Sprague, created the project for sixth graders to research and support a local non-profit organization of their choosing. And Jade Edwards selected Magicians Without Borders. There was a great turn (especially for a snowy night), and we raised some serious fun as well as almost $400 from donations, raffling off a beautiful box of magic tricks, and selling hand made foam swords and shields made by Jade over the last few months. The evening was entertaining, informative, and inspiring, and Tom and Janet felt grateful and proud of Jade and their amazing home town. As a Lincoln resident said afterward, “I can’t imagine raising my children in a town that did not have the magic of Tom and Janet in it.” Doesn’t get much better than that! This entry was posted in Featured News, Fundraisers, Media, Performances, Uncategorized, VT Shows. Bookmark the permalink.